HARRISBURG, PA, October 23, 2017 – Pennsylvania Sen. Christine M. Tartaglione’s annual Disability Employment Awareness Day connected hundreds of State Capitol visitors with advocacy organizations from across the Commonwealth this afternoon. A dozen public and private-sector providers teamed up to offer guests comprehensive information about a wide array of accessibility products and services, all with the shared goal of helping people with physical and cognitive challenges find and retain meaningful employment. The cause is very personal to Senator Tartaglione, who has spent the last 14 years overcoming the spinal injuries she suffered in a 2003 boating accident. Today’s presenters included public agencies such as the Pennsylvania Office of Vocational Rehabilitation and Office for the Deaf and Hard of Hearing; medical providers like MossRehab; academic institutions including Temple University’s Institute on Disabilities; and financial resource providers such as the Pennsylvania Assistive Technology Foundation. 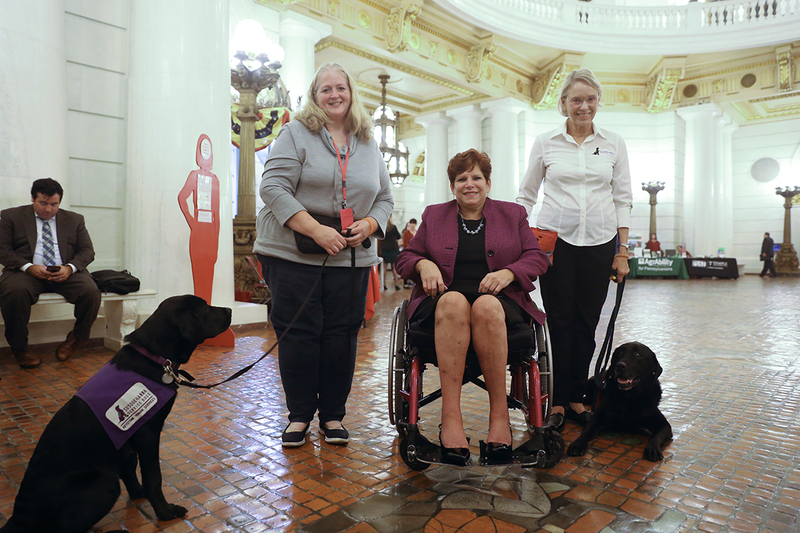 Three service dogs in training – Ajax, Aero and Rugby –also graced the Capitol Rotunda with their enthusiastic presence courtesy of Susquehanna Service Dogs. “We have one office in King of Prussia but we have a statewide influence. Doing outreach is always challenging for us, but (today’s event) certainly connects us with people,” PATF Operations Director Tracy Beck said.